Yesterday saw the official launch of Wholesale Broadband Connect (WBC) on BT's new 21CN platform. WBC is one of the new platforms used for deploying ADSL and ADSL2+ in the UK upon the 21CN network, and delivering the customers traffic to broadband services providers. It requires broadband service providers to connect to BT at up to 20 aggregation points around the country to provide coverage for DSL services to all telephone exchanges. Providers will also have the option of a managed solution, WBMC, which only requires one interconnection point, but this is at a higher cost to the service provider. They can also mix and match the two (WBC and WBMC) to use WBC where the provider has a large concentration of users and WBMC to pick up the rest. What does this mean to the average broadband user you may wonder? Well, with WBC comes the faster ADSL2+ services which provide a broadband connection speeds of up to 24Mbps. As with existing 'up to 8Mbps' ADSL Max services, the speed is rate adaptive (i.e. it will vary) and it depends on line length and other conditions such as the condition of the telephone extension wiring in the home. Different ADSL modems and routers can also have a dramatic effect, both on the stability of a connection and its throughput speeds. The modem or router does have the ability to connect at 24Mbps which is the most common seen figure mentioned in relation to ADSL2+, but this is just the maximum 'line rate' for the DSL service. Once layers such as IP have been added to make the service work, users should expect no more than around 21.5Mbps on only the shortest of phone lines. The ADSL2+ being deployed by BT is no different to that of existing providers such as O2/Be Unlimited and Sky/UKOnline who have provided faster services using ADSL2+ for some years and can potentially serve around 60% of UK households. The BT availability checker has been updated to include 21CN details so you can see if it is available in your area. An indication of the speed you can get is also available from the checker. 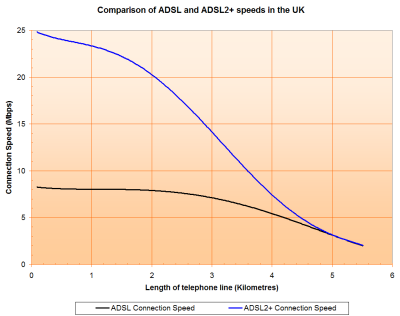 If you are not in a 21CN enabled area, your speed can be estimated using the graph below. The new services on 21CN only have a small initial roll out; only 82 exchanges were expected to go live for the 30th of April. Coverage should rapidly increase, however, with 868 exchanges expected to be enabled by May 2009 which should cover around 10 million homes and businesses. As has been evident, there is a lack of any announcements by service providers introducing new products based on the new 21CN services. The lack of coverage for 21CN is one obvious reason for this. Another, as reported by ISPreview last week is the lead time in getting WBC services actually installed. Some providers who were on the WBC trials such as BT Retail or Entanet (and their resellers) could offer services sooner as they will already have the necessary infrastructure in place. Others may be waiting until the coverage increases till investing in the new network. BT have gained some flack from an analyst in a recent BBC news article where Ian Fogg of Jupiter Research noted the tardiness and small size of the initial roll-out. One point to note about this is that ADSL from BT has taken 8 years to get to its 99.9% coverage and BT intends to switch the whole UK infrastructure over to its new network, 21CN, by 2011 with 55% of broadband users completed by May 2009. No small feat by any means. One small snippet of information showing the future for WBC and what the 21CN network will allow is that BT Wholesale is conducting a WBC over fibre trial in Ipswich. "One point..ADSL from BT has taken 8 years to get to its 99.9% coverage and BT intends...by 2011 with 55% of broadband users completed by May 2009. No small feat by any means." It took far too long to roll-out last century's technology in the first place. Nice to see them doing it a bit faster with last decade's technology but I'm still not impressed. I got ADSL2+ from BeThere in March 2007. It's quite easy to cherry pick exchanges, it's a completely different matter to having to build a UK wide network to support every single exchange in the country, without breaking existing services. "Providers will also have the option of a managed solution, WBMC, which only requires one interconnection point, but this is at >>>a higher cost to the service provider.<<<"
Well obviously. No Universal Service Obligation for broadband, and definitely not at a universal price (unless it's BT's price). And in the absence of competition or meaningful regulation outside cable/LLU areas, it's another nail in the coffin of affordable broadband outside cable/LLU areas; enjoy nationally-priced IPstream while it lasts. BT won't have any customers left on this exchange given the 21CN implementation date (2010). The exchange has every major LLU player present so frankly anyone staying on IPStream for the next 2+ years needs a sanity check. WAY too little and WAY too late. The only thing BT deserve praise for in the last decade is ADSL coverage and lets face it, they were forced into that by govt. "they were forced into that by govt." I hate agreeing with herdwick, but he's right on this. I agree with the last two posts, and that is certainly backed up by concrete evidence, BUT had BT not rolled out the adsl etc then one thing is certain others would have really pulled the plug on BT. BT have made some extremely smooth moves, they have only provided the little that they have to prevent the opposition/competition from pulling the rug completely from under them. 21st Century network is only being installed to greatly reduce BT running costs and greatly increase the return to shareholders, will those of us in the provinces see any benefit. Little or nothing appears to be the answer. @boggits: Is that an official announcement? It's an interesting idea, now let's have some detail behind it (not here though :)). @Rizla: Surely you mean BT*wholesale* won't have many customers on your exchange? BT Retail will still have a few, just by inertia selling (and worse). That leaves BTw with mostly the expensive exchanges, and thus the £10 non-LLU surcharge in today's O2 announcement will only get bigger. Or will BT Retail go LLU like Danon wanted? you havent seen this then?? ATM is largely being replaced by Ethernet in 21CN. That said, there will still be traces of it since PPPoA (PPP over ATM) will still be used for handling DSL connections between end user premises and the MSAN in the exchange." Not sure what your point is. My point is that the 21CN changes aren't between punter and "exchange" (which is where the noise problems are, in the "DSL connections between end user premises and the MSAN in the exchange" as Sam says). The big 21CN changes are in the connections between exchanges and backbone networks and that side of things. I don't quite agree with Sam's terminology (you can run lots of protocols besides IP stuff over Ethernet, whereas this is likely a pure-IP network) but I see why he's described it that way. "The ADSL2+ being deployed by BT is no different to that of existing providers" ouch mrsaffron bad misinformation there. It has the profiling and higher contention ratios. oops sorry I mean John the author. Whilst BT may not have been forced to do a 99% coverage I expect they were softly pushed in that direction by ofcom with a behind closed doors threat of legislation if they didn't do it. If they chose to do 99% coverage 100% by choice then it gives less credibility to the claims that those areas have no profit. Does anyone have experience of mobile broadband coverage in Cornwall? I travel down their regularly and am thinking about signing up with a mobile broadband provider but have heard coverage can be poor in some rural areas. I’ve been looking at various different mobile broadband providers here: http://www.broadband-expert.co.uk/broadband/mobile and am leaning towards Vodafone. Any advice would be great. I don’t want to sign up and find I’m paying for a product that doesn’t work!